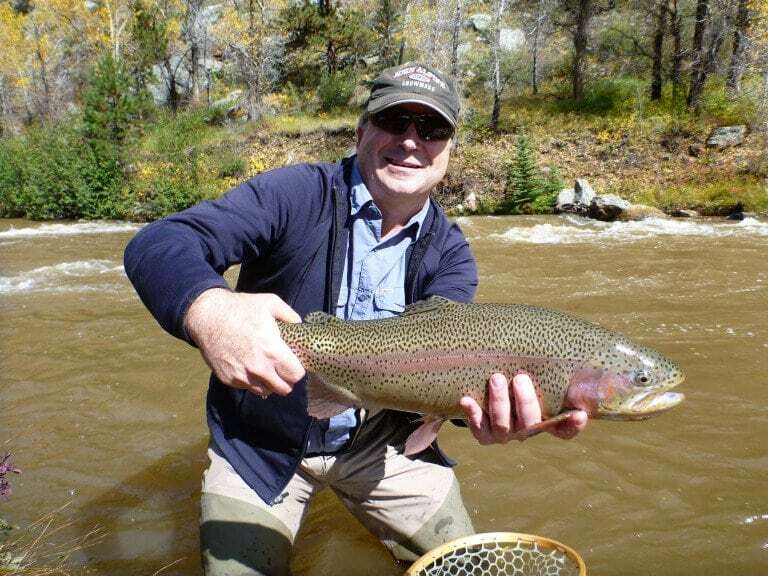 With quality fly fishing available in the Boulder area 365 days a year, Front Range Anglers is proud to be able to offer customers one of the largest portfolios of available water in the Denver and Boulder Metro area. That’s only one reason that makes Front Range Anglers the number one guide service in Boulder. Whether you are looking for tranquility on your own private stretch of river or are a first timer looking to catch your first wild trout on a fly, we have water that will fit your needs. Contact our guide services team today for the perfect trip based on your schedule and desires. Bear Creek is a true Front Range gem. If you like fishing dry flies to rising fish, this creek is for you. Packed full of healthy Rainbow and Brown Trout, this beautiful cascading creek is best know for its mild run-off, making it a great option for your April – June trips. The Big Thompson or the Big “T” as it’s known to the locals, flows out of the Front Range and is one of the best tail waters we have close by. With its head waters beginning around the corner in Rocky Mountain National Park, the river flows through the park, through downtown Estes, and into Lake Estes. From there the water is released from Olympus dam and heads down “the canyon” where US 34 follows the river on its journey towards the flats of Colorado and the town of Loveland. Boulder Creek is one of Boulder’s most prized possessions, running from Barker Reservoir through town past the campus of CU and out into the flats of Colorado. From start to finish this is a fine trout fishery full of wild browns, rainbows, and even some colorful brookies up towards the town of Nederland. If you can really devote some time to fishing the creek there are even a few cutthroats to be found. Go for the Boulder Creek grand slam! Clear Creek is a great river that has been damaged from years of mining abuse, but now is on the rebound and is a great way to spend a day. With the headwaters beginning at the Continental Divide near Loveland Ski Resort, the stream flows downstream into the small mining town of Georgetown where you will find classic pocketwater fishing to small rainbows, cutthroats, and brookies. From there the river flows east until it hits route 6 where it enters Clear Creek Canyon. This just might be some of the best scenery to be found on the river. This may just be one of the best resources that the Front Range of Colorado has to offer. The “Park” as locals like to call it has too many lakes and streams to begin to speak about. The Park really has it all, from big browns in Moraine Park to beautiful native Greenback Cutts in high mountain streams and lakes. The Greenback is the Colorado state fish and was thought to be extinct around the turn of the century. Lucky for anglers a remnant population was found and RMNP has gone through lengthy efforts to return the Front Range’s native trout back to its home range. Located just out side of Lyons, Colorado, the St. Vrain is talked about in many John Gierach books. This stream is full of browns willing to eat a variety of dries and nymphs. This is a great option for half day trips throughout most of the season! Enjoy roughly a mile of private river access on Colorado’s famed Arkansas River. Nestled in the upper valley above Buena Vista, this stretch of river sits a few miles below Twin Lakes, one of the river’s primary water sources. Over the years it has become one of our favorite pieces of water to offer, with little fishing pressure and a strong fish population. Anglers enjoy fishing broad flats, smaller side channels, classic pocket water, and deeper pools for wild rainbows and browns. Due to it’s upper location on the Arkansas, this stretch becomes a viable fishing option much earlier than the lower river. Fishing in May and June can offer some of the finest caddis dry fly fishing the state has to offer. The later summer and fall months offer exceptional hopper, dry fly, and nymph fishing. Come enjoy what all the guides are raving about! Pricing includes all necessary equipment; rods, reels, waders, boots, flies, etc. as well as transportation, rod fees, and lunch. As with all Front Range Angler Private Water trips, the only two things not included are guide gratuity and Colorado fishing licenses for the day. One of the three private offerings FRA has on the Arkansas River, this stretch is uniquely different than the other two from a fishing perspective. It still requires the longer drive, but anglers willing to sit in the car will be rewarded with Gold Medal water. With over a mile of access, it is a perfect full day destination. Our guides begin to look at this stretch in the beginning of may as the dry fly fishing starts to turn on. The Big Bend water is an ideal place for dry fly fisherman. If you like fishing dry dropper rigs, this is the stretch for you. It is the perfect place to enjoy true solitude on a great piece of water. A favorite of many Colorado fisherman, the Big Thompson River gains a lot of attention from Front Range Anglers. This private stretch of river gives anglers a unique opportunity to experience unpressured angling on this great fishery. Located below Lake Estes, anglers will experience wonderful canyon pocket water, dry fly flats, deeper channels, and pools. Since the Big T is a tailwater, the fishing season is relatively long, and the dry fly fishing is consistent for most of the Spring, Summer, and Fall. All skill levels will be pleased with what this stretch of river has to offer. It also offers an awesome streamside picnic table for lunches on the water! Pricing includes all necessary equipment; rods, reels, waders, boots, flies, etc. as well as transportation, rod fees, and lunch on full days. As with all Front Range Angler Private Water trips, the only two things not included are guide gratuity and Colorado fishing licenses for the day. Tucked between the historic mining towns of Georgetown and Empire, this mile stretch of Clear Creek offers fly fishers off every skill level an opportunity to experience one of the Front Range’s favorite fisheries. Unlike much of Clear Creek, this section of the river runs through a meadow section, with good structure, deep bend pools, and large rocks, providing excellent holding water for trout. Primarily home to browns, rainbows, and the occasional cutthroat, anglers will be surprised by the quality of the fish in this section, with the potential for a lunker rainbow at every bend. As one of main thoroughfares for runoff, Clear Creek is a phenomenal option beginning in late June and fishes well throughout the summer and fall months. This 5 acre lake is the perfect place for anglers wishing to learn how to fish stillwater effectively. With a strong bug life and abundant numbers of flathead minnows, the consistency of the fish caught here is great. Fish average anywhere from 12-20 inches with some browns that are considerably larger. Float tubes are very useful here because of the willow covered shoreline. If you have been hoping to learn lake tactics, look no further than Empire Lake to get you started. Empire begins fishing in late April and is generally fishable until well into October making it an ideal Spring, Summer, and Fall destination option! The close proximity of this destination to Boulder makes it even more appealing. Empire Lake is also a great option when the rivers are high during Spring runoff. This ¾ mile stretch of the Lake Fork is a brown treat heaven. Located below Turquoise Lake in the Shadows of Mt. Elbert, this tailwater has consistency of flow and water temperature, making it a viable option during the Spring, Summer, and Fall. One thing that makes this stretch so fun to fish is the character of the water. The river meanders through open grasslands with undercut banks and long riffle sections, perfect for both dry fly and nymph fisherman. Not only is this property a great fishing destination, the beauty of it is hard to match, flanked by two of the Rockies highest mountain ranges. Due to the longer drive time, full day trips are required for this property. Located on the banks of the North Fork of the South Platte River, North Fork Ranch is one of the premier private properties in the Western United States. As the closest Orvis Endorsed Lodge to FRA, we are happy to offer fly fishing trips to this exclusive destination. Due to the structure and character of the water on the ranch, fishing can be phenomenal for a large portion of the year, starting in mid April and stretching throughout October. Anglers fishing here have a true shot at trophy rainbow on every cast and your fish landing skills will surely be put to the test. To sum it up in short, you fish big rods, heavy tippet, and carry a large net when fishing here. Whether you are new to the sport or an experienced angler, NFR has something to offer you and when the day is over, you will probably leave already planning your next trip back. Not only does North Fork Ranch offer exceptional fishing, they also offer lodging accommodations that are top of the line if you need some place to stay. FRA has a set of exclusive dates at the ranch for 2017. If one of our exclusive dates doesn’t work, don’t worry! We can probably get you out with one of our professional guides on a date that better fits your schedule. Pricing includes all necessary equipment; rods, reels, waders, boots, flies, etc. as well as transportation, rod/access fees, and lunch on full days. As with all Front Range Angler Private Water trips, the only two things not included are guide gratuity and Colorado fishing licenses for the day. North Fork Ranch can accommodate 6-8 anglers, sometimes more for corperate gatherings. For more information, call Antonio at 303-494-1375. Located within an hour of Boulder, this gem is tucked off of the main highway that leads to the mountains. One of our favorite early season, high-water destinations, Silver Valley lake is a gorgeous 4 acre lake, full of Brook Trout, Snake River Cutts, Rainbows, and Donaldson Steelhead. Silver Valley can both be fished from the bank, searching for large cruisers, or from belly boats. The beauty and size of the fish here is only surpassed by incredible mountain backdrop. Since Silver Valley is not a long drive from the shop, this private lake can be reserved for both half day and full day outings. Located in a sunlit valley at the mouth of The Big Thompson Canyon, this working dude ranch has it all. With a picture perfect section of Main Ranch River, and the Big Valley Lakes that hold some big fish, a day of guided fly-fishing at Sylvan Dale Guest Ranch is simply incredible. Sylvan Dale also has comfortable riverside cabins that are great for groups or families looking for lodging to compliment their fishing plans.